Belvoir presents, MOTHER COURAGE AND HER CHILDREN, by Bertolt Brecht. 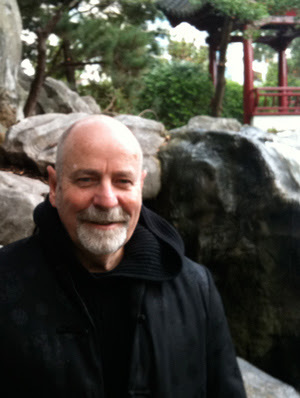 Translation, by Michael Gow. In the Upstairs Theare at Belvoir St Theatre, Surry Hills. 6 June - 26 July. Bertolt Brecht was born in 1898 in Bavaria. He was 16 when the First World War, led by Germany, engulfed Europe for the next 4 years. He watched and then experienced the fatal reparation demands on defeated Germany, from the Paris Peace Conference, in 1919, that the victors made, primarily represented, led, by the American President Woodrow Wilson (who also dreamt of the founding of a League of Nations), the English Prime Minister, David Lloyd George (assisted by Winston Churchill and Maynard Keynes), the French leader Georges Clemenceau and Marshall Ferdinand Foch, with, Vittorio Orlando of Italy (Brecht watched the forced creation by the victors of three new countries - Iraq, Yugoslavia, Israel - whose troubles haunt us still). He began his theatrical career through the dilemmas of the Weimar Republic attempting to respond to the demands of the Peace Treaty, and then, further, through the times of the rIse of the Nationalist Socialist Party, led by Adolf Hitler. He witnessed the democratic/capitalist leaders of the world and their ability - and will - to ignore the realities of the means that were being used to create, make possible, the German Nazi rise to force in 1933. Fearing persecution as an artist, Brecht fled to Sweden, and then, in 1941, to the United States, the leading capitalist power of the world. Brecht was a fervent Marxist and Socialist. Living in the United States during the calamity of World War II, he was able to watch the decisions of that country close-up, watching its reluctance to enter the European campaigns against Nazi-fascist aggression, whilst, seemingly, making profit in the selling of armaments to both sides (mirroring its capitalistic enterprise during the early years of the calamity of World War I), until the Pearl Harbour attack, which made it, virtually, impossible for the United States to continue to ignore the resultant horror of the "Human Smoke" that the European war was making, and that the threat of Japanese ambitions in the Pacific was to do. He watched capitalist leaders make decisions that led to unheard of profits for business but which, also, led to an irreparable cost to the human soul and moral values of that nation, of all humanity. MOTHER COURAGE AND HER CHILDREN, was written as a response to Hitler's invasion of Poland in 1939, whilst Brecht was in self-exile in Sweden, and had a failed performance in 1941, in Zurich. Brecht lived out the war in Hollywood. He returned to Germany in October, 1947, the day after facing the House Un-American Activities Committee (HUAC) in Washington, being suspected of being a member of the Communist Party, which he had never joined - "a suspect agent of the Soviet government" - and after being invited to Berlin, to the Deutsches Theater, in East Berlin, directed the play, MOTHER COURAGE AND HER CHILDREN, in 1949, with Helene Weigal, his wife, creating Anna Fierling (Mother Courage). MOTHER COURAGE AND HER CHILDREN, is a powerful criticism of the capitalist system, of its dehumanising capabilities and the resultant possibilities of a loss of moral balance. It is written by a passionate Marxist/Socialist. It shows how capitalism can bring people (a mother, in this case) to do things completely out of character in order to protect themselves and their business - where the saving of the business preempts all else. His observations of the core causes of war and of the two catastrophic twentieth century World Wars, and of his fear of a third, a Nuclear one, are deeply embedded in this work. The Thirty Years' War was the berserk start of a relentless March of Progress that steadily and violently went on to transform the world. Most of us in the West know this famed Progress (today) by its premium brands: free markets, the secular state, civic society, technological innovation, the rule of law ... the lizard brain of modernity. 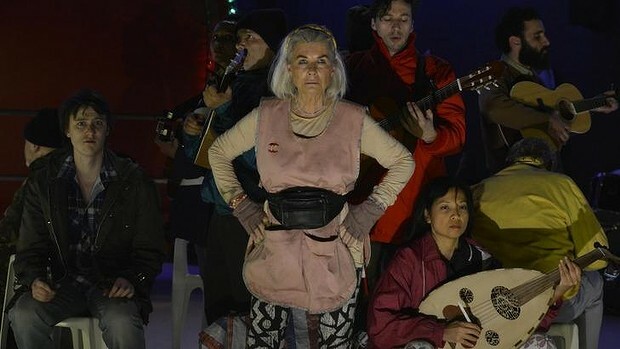 However, sadly, with this production at Belvoir of MOTHER COURAGE AND HER CHILDREN, Directed by Eamon Flack, there is – I can assure Canberra and their Cultural/Political national guardians – no blatant "lefty lynch mob" at work here, and that no "heads should roll" as a result of the choice of this theatrical critique of capitalism, or this Belvoir production of it. A more blunted, tamed production of the play, by a major company, probably, could not be found. Indeed, most of my audience left the theatre just as relaxed and comfortable about the society it was living in and its governmental 'habits' - that it is electing - as it was when it went into the auditorium, and seemed mostly occupied in foyer discussion afterwards, by the choice of which restaurant they were to eat at and what wine to drink, and to vociferously wonder at the sprightly energy of Robyn Nevin on stage, considering her age, and at the 'magic' of her 'dazzling' make-up employed for this production. For, truthfully, it was probably the draw of the touted talents of Ms Nevin that caused their buying of the tickets to see this play than the famous talents and (in)famous philosophic stand of Bertolt Brecht, or the fame of the rarely staged MOTHER COURAGE AND HER CHILDREN. This production was an entertainment of a bourgeois comfort, an anaesthesia, part of a 'bourgeois narcotics trade', given by Mr Flack, starring Robyn Nevin, and, generally, abetted by his company of actors, the plat text not having been penetrated deeply enough with any scrutiny of the content of the play or of Brecht's methodology, because of the sentimental attachments to the plight of the woman Courage and her children, being underlined, here, by the dominant theatre of empathy, hall-marked with a Stanislavskian point-of-theory, of which Brecht, in his time, was in vocal variance. The audience at Belvoir was encouraged to engage in emotional identification with the characters' plight. Indeed, the quotes from Michael Gow's play, ONCE IN ROYAL DAVID'S CITY***, in the program notes - Mr Gow is also the translator, from the German, of Brecht's play for this company - of Will's final speech concerning the need to "Feel a lot. Huge feelings." may account for the position taken by Mr Flack, in his composing of the production. This is contrary to the Brechtian mode, which is to have the audience see and understand the cause of Courage's choices pressured from the structure and construct of the capitalist system/society that she, lives in, struggles with - which we are no less inveigled with and by - so as to reveal a social causation beneath surface appearance. To have the audience challenged to think rather than to just feel, so as to learn - the pleasure of learning designed to foster critical intelligence - that might lead to change to the way of the world, from us the audience, to the usual societal engines of action. It was that that MOTHER COURAGE AND HER CHILDREN was meant to be, the first play representing what has become known as Epic Theatre. Epic Theatre, the most famous element, of which, is known as the deployment of 'Verfremdung', the term rendered in English over the years as 'alienation', 'estrangement', and 'defamiliarisation' - to 1. help the audience to see the familiar as striking, the normal as amazing - to 2. have the audience to view a figure or situation in a naive way, i.e. in an 'innocent' way, by asking theatre makers, including the audience, to look on dramatic material with fresh eyes, to 3. wonder at what is happening rather than taking it for granted. To 4. have the audience watch actors play-acting a character, making choices within a social context, to 5. make the familiar act of going to the theatre, as an audience, strange: i.e. different to the old methods of the actor 'being' the character and having us believe in an emotional response/state without the complication of thoughtful analysis. To 6. ensure that the whole of the performance, the storytelling, has a political thrust of thought, and not just an emotional identification and catharsis. I was surprised (shocked) that in a Radio National (RN) ABC interview with Michael Cathcart (Books and Arts), Mr Flack confessed that he did not know what 'Verfremdung' was, and that he was not particularly curious about it. This, certainly, might make for a contemporary Australian production 'colour', and be in some arguments a legitimate stance, but, for me, simply re-enforces what I believe is a fundamental wrong with our present, general, artistic aesthetic: its lack of intellectual rigour, and worse its lack of curiosity about what has made a work a 'classic', in this instance what has made Brecht's work great, and what can make it one of the peaks of the what is known as the 'Classic' repertoire, today. Mind you even Brecht with the first production of this play began "cautiously introducing the Epic mode in rehearsals" and added "We really need four months of rehearsals." (2). One wonders what rehearsal time, preparation, did this Belvoir company have? Not four months, for sure. Maybe, four weeks? How could this play then resonate for an Australian audience, since the devastation of war in our country is, mostly, an abstracted experience? Not with too much difficulty, I remember. Certainly, resonance, relevance was rung in the winter of 1972, in the then, relatively, neglected wreck of the Princess Theatre, in Melbourne, when the Melbourne Theatre Company (MTC) presented MOTHER COURAGE AND HER CHILDREN. The affect was a great one, a shattering one for us Australians who managed to see it. Joachim Tenschert directed a staging of the original Berliner Ensemble production with Gloria Dawn as Courage, supported by Wendy Hughes, John Wood, Tony Lewellyn-Jones, Frank Thring, Fredrick Parslow and Jennifer Hagan. And later on the minuscule Jane Street Theatre stage (three times smaller, perhaps, than the Belvoir stage), under the auspices of John Clark's NIDA, in 1978, when Aubrey Mellor directed a memorable, hauntingly experiential production with Kerry Walker as Mother Courage, and included amongst others, Angela Punch-McGregor, Jenee Welsh, John Smythe, Stuart Campbell, Robert Menzies and John Clayton. It, too, set in the bleak period of its history, was a visceral triumph of heart and head. (The relatively recent production at the Sydney Theatre Company (STC), Directed by Robyn Nevin, and with Pamela Rabe, as Mother Courage, never reached or seemed to understand the Brechtian needs and intentions, if comparisons are made). On a 'dirty' white painted set, with a rectangular black space demarcated in one of the corners of the stage, where a piano, props and chairs, (Set Design, by Robert Cousins), with some actors, dressed in a mishmash of contemporary clothing and army uniform - looking as if found in second hand op-shops - are present (Costume Design, by Alice Babidge). The Lighting Design by Benjamin Cisterne completes the visual offer for the presentation of this production - so far, so good. However, when the wagon of Mother Courage appeared, dragged by her children, one was startled to see a mini, solid caravan, painted a dull gloss red with two 'streamers' of coloured light bulbs, bristling, at both ends of the vehicle, and a prop-up-and-out window, in one side of the vehicle, to reveal hung packets of 'junk' items that one might find in a side show alley van, attendant as a fair ground/circus support. It looked as if it was where one could buy hot dogs, and fairy floss. For me, it hailed-back to the Australian vaudevillian stage, in colour and razzle-dazzle, that was a favourite choice of the old Nimrod/Belvoir visual style of the 1980's, led by the artist Martin Sharp: this wagon looked like the Martin Sharp Hot Dog Wagon! That the wagon was virtually 'parked' in the one place for most of the production, it rarely moved, except to another near-by parking position, but for the final lone pull from the lone Mother Courage - Ms Nevin, finding it a little too heavy for her to do much - I kept thinking of my Christmas Holidays up in the Calypso Caravan Park at Yamba, and the caravan sitting on bricks, selling everything from fishing weights to fly and mosquito spray, to Wrigley's chewing gum. Just what world or war zone it was meant to represent was difficult to imagine. It was never a war zone for me - it was a big visual distraction contrasted to the textural information coming from the actors. Too, I felt the new score to the songs (Music Composition, by Stefan Gregory), though interesting, was more referenced to the early 1920's Brechtian plays: THE THREEPENNY OPERA (1928), HAPPY END (1929) and THE RISE AND FALL OF MAHAGONNY (1930) - created by Kurt Weill - than to the post-Weimar music collaboration that Brecht made with Paul Dessau with the original MOTHER COURAGE and other work that followed e.g. THE GOOD WOMAN OF SETZCHUAN (1947-48). The psychological seed of creativity, for the two periods, are remarkably different in tone. It is heard in the original scorings. Not at the Belvoir. One of the Sydney critics, Jason Blake - (Eight Nights A Week) - observed that the production looked as if it were still in the rehearsal room in its visual choices. I concur, and it was dismayingly so in the climatic scene with the drumming and death of Courage's daughter, Kattrin, where instead of being placed on the roof of the wagon, the actor was required to stand on a white plastic chair from the local hardware store, in front of the Red Wagon, and thus undercutting the impact of the image that Brecht had so carefully organised in his famous ARRANGEMENTS - of the 'fabel'. The acting from this company: Paula Arundell (outstanding), Tom Conroy, Lena Cruz, Michael McStay, Alex Menglet, Arky Michael (his usual fully-fledged commitment - outstanding ,too), Anthony Phelan (focused integrity), Richard Pyros, Hazem Shammas and Emele Ugavule, is the stuff of energised commitment to the production directions of Mr Flack. Ms Nevin, as Mother Courage, is admirable in the sheer energetic force of her presence on stage, and is, initially riveting in that affect, (particularly with her make-up), but lacks, as the play proceeds, much variety of choice in the work, the journey, and confrontations that Mother Courage has, and seemed to give, rather, a clock-work effort of a taut technical control where the general tone of the performance was a ' kind of air of diffidence' (maybe what Mr Flack and Ms Nevin understood was the 'Verfremdung' effect), with an indifference to the contributions of the other actors - an appearance of an actor in a focused isolation, barrelling, relentlessly, through the play. A hands-on-hips stance and intimidating, no-nonsense glare, basilisk-like - have we seen that before? - dominating the pictorial choices of her woman. Ms Nevin's brand-traits, again, on stage, are too much and, yet, I believe, not enough for the variety of reveal - deep personalisation - that taking on Mother Courage demands. The energy required for the role seemed to absorb most of Ms Nevin's creative output and focus. Ms Nevin herself expressed her nervousness of being 'too old' for the role in a Belvoir pre-show video - for it is a role that demands much of one, not only in artistic construct, but in sheer animal stamina. Ms Nevin's Mother Courage was rather a kind of Grandmother Courage and one regrets that actors such as Susan Prior, Paula Arundell and Anita Hegh were not pulling the waggon (well, a wagon of another look), across the fields of war, for their art and craft deserved the exercise that Ms Nevin had claimed - we will have to wait, as usual, a long time to see our next production of this great play, and so the loss of seeing the actors that, today, belong to the generational age of Brecht's character, and deserve the challenge, must be borne. Sometimes one feels (perhaps, ungenerously) there is a box-tick of the Great Roles that Ms Nevin, is attempting to cover and conquer while she can: Hecuba - tick; Mary Tyrone - tick; Madame Ranyevskaya - tick; Queen Lear - tick; Mother Courage - tick, whether it is appropriate or not (can one think of another actor of Ms Nevin's age that could have played the role?) One hopes that The Lady of the Camellias, or Scarlett O'Hara in Gone With the Wind - the Musical version, is not to come, on that tick-box list! - if there is one. All in all I was not bored by this production but I felt that the Directorial hand was in charge of a Chekhov play (with music) rather than a Brecht play. It gave one confidence about Mr Flack's next effort which will be IVANOV - an early melodrama from the Chekhovian canon. This production of MOTHER COURAGE AND HER CHILDREN was, compared, to my other experiences of this play, a disappointing one. I felt that the context of the origins of this text were not sufficiently thought through and solved for an Australian audience in 2015. The play seemed to be read from the 'relaxed and comfortable' bourgeois of Sydney, and was interrogated so superficially, that an audience could only be puzzled as to why this play is regarded as one of the most famous plays of Brecht's, and one of the greatest of the 20th Century. It reminded me of my despair over the CHILDREN OF THE SUN production at the STC, last year - a play of much less reputation, of course. This production has now gone from the stage and sits in the ephemera of all our memory. What one remembers is so personal - built from one's experienced interaction with life. With life with all of its permutations - fictional and factional. Little Baghdad: Let's Party Like It's 620 B.C.